Zinn Will Vote for Nader! This letter to Ralph Nader retracts Professor Zinn’s previous endorsement of Obama. He gave us permission to publish it. I was wrong in saying I would vote for Obama. I was not thinking of the slam-dunk states, of which Massachusetts is one, and I will vote for you in Massachusetts. I still think that the electoral arena is one that saps our energy, and gets us nowhere. What you say about civic activity not having a chance to change policy is pessimistic and wrong, and if civic activity cannot be effective then electoral activity will be even less effective. Civic activity is the only way things can change — you should know that better than anyone because you’ve been so good at it. 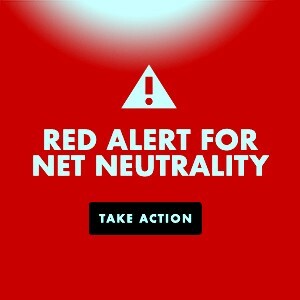 Such activity affects public opinion which in the long run, when it becomes widespread enough, forces changes in policy. Electoral activity, in a managed political system when the candidacy of third party candidates can only show weakness, will not change public opinion. We are not in a Debs-era situation, when a powerful Socialist movement represented millions of people. Chomsky, Zinn, and Obama by Mickey Z. This entry was posted in Nader-Ralph, Politics and tagged 2008 Election, Dandelion Salad Posts News Politics and-or Videos, Howard Zinn, Ralph Nader, Ryce-Manila. Bookmark the permalink. I think you are right, not wrong, if only for participation in the debate about the vast problem at hand: The complete lack of debate. Yet so sparse are the individuals of conscience that each and every moral mammal in this land is precious. But golden are our few seers, those who have devoted their lives, intellect and voices and breaths to the thankless pursuit of peace, progress and truth. All due respect to Barack and his efforts, these are indeed among the darkest of modern times for morality, democracy and intelligence. Thank our lucky stars for the great seers & speakers whom the killers have let live thus far. If Dr. King could have been with us all this time, perhaps popular inspiration would have been lead to trend a different way in the USA. Speaking out against war takes the greatest courage, it is a transcendental contribution, and as Marla Ruzicka and Rachel Corrie would attest, deathly dangerous. I think we need to find the intelligent pacifist leader within, since the leaders who would inspire action for peace will be all too often disappeared or disabled (Hoffman) or disparaged, disgruntled & corrupted closet republicon (Rubin). We need to Teach Peace ourselves, and unanimously defend whatever visionary leaders remain. Don’t get me wrong, I’m not trying to denigrate the insights of Chomsky and Zinn. But outside of an academic context, what have they done for us lately? Unlike Kucinich and Sheehan, whom I admire immensely, I don’t see either of them getting behind any social movements. They remain in their (comparatively) comfortable academic bubble. Eternal gratitude to both Zinn and Chomsky– they’re both far from ‘tired’ as we’ve seen. If even 1% of the populace exhibited half the activism and dissent these two octagenarians continue to manifest, perhaps the people of the electorate would not now be the the real party of criminal US complicity and corruption that they clearly are. It seems to me that Zinn & Chomsky are not politicians, nor even leader-style activists per-se, but rather seers, visionaries, very learned men who lead us only to hard-won social knowledge. Perhaps it’s time the people stopped looking to politicians and leaders to define their ideology, and look instead to the profound complicity and corruption in the hearts and minds of the Amerigoon populace which allowed the last admin to get away with the horrors it has (and apparently will). Perhaps its time to acknowledge that the problem is not the media, nor the parties, nor the corporations, nor the ‘system’ (which the vast drooling crowds of ‘Joe the Plumbers’ willfully espoused, supported and sponsored and still do in droves to this day), rather it’s the people who are the problem. The information is all right here, yet as we see only a money crisis can even slightly sway the slimmest majority toward the lesser of warmongers (purely as an accidental byproduct of their own selfishness). Blame not the last of the old-guard activists who with their remaining breath beseach us to think before we bomb, who unlike the daft drooling droves actually remember the warcrimes of our past and present. Blame instead the populace who purposefully forgot the horrors of their ideology and who despite all, still to this day march like lemmings behind the criminal conspiracy which they actively put in place and decisively refused to hold accountable regardless of epic atrocity committed in their name and with their support. There remain two great leaders, born political visionaries running for office in this cycle who remind us to remember with the required passion and power: Cindy Sheehan and Dennis Kucinich. If they don’t both win next week by vast landslides in their respective districts, then I rest my case. Of course we in ‘slam-dunk’ states will vote for Ralph, he is a true advocate for the people for decades now. But it is a sad time for ‘third parties’, as Ron Paul just pointed out on Maddow regarding why he remained GOP: The rules are made by goppers & dems, indies can’t even get on the debates, they’ll waste all their money just trying to get on ballots– But parties are almost irrelevant. This idea of democracy and voting is so far gone in this land it would take decades of popular struggle to make a dent in the promotion of democracy for the people (though a worthwhile struggle indeed). Yet not even blatant election fraud with disastrous consequences changed a thing. There’s not even a glimmer of dissent to this day against the horrific crimes of both parties in these last two cycles. Considering the popular complicity in american corruption, all a progressive voter can hope to achieve in this election is (perhaps an uncounted ballot for) a little more intelligence and a little less war. Domestic democracy in this land is clearly a lost cause ‘for now’. A sentient being who happens to find themselves floating in a red state of joe the mouth-breathing, wolf-killing, gun-blaring maniacs, in light of the complete failure of dissent to materialize despite the most extensive alternative news options ever available, is to vote against McBomb. The rest, including third parties will apparently be a very long time coming indeed (and if the past 8 years was not enough to activate the populace I truly don’t want to be around to see what sort of calamity it will take to prompt the people to exercise their supposed rights). But if you live in a too-far-gone state that’s already a diseased Limbaugh-imbibing lost cause, or if you live in a sure-fire anti-mcBomb state, then by all means cast a vote for true change as espoused by Ralph Nader. But if you’re in a swing state, the dire predicament leaves little choice but to hope to help sway your state to tip McBomb away from making more war. After that, good luck to all who wish to enlighten the people of the red-state heartland– one would need an expert in de-hypnotizing cults to convince joe the gun-toting fundamentalist bible-belted maniacs that the militaristic mcbombs who epitomize their party don’t represent their interests. You’d have an equally hard time convincing the upper-left side democratic stalwarts that their impotent warmongering corporatist enablers Pelosi, Reid & Conyers represent any sort of opposition. I don’t know why Zinn and even people like Chris Hedges claim Nader is “pessimistic” or is somehow against the concept of citizenship. 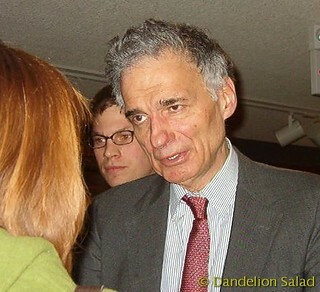 You will not find a more eminently qualified or articulate proponent of civic virtue than Ralph Nader. If anything, Nader is far more optimistic than Zinn. I almost hate to say this, but it seems to me that both Zinn and Noam Chomsky (who also made a recent statement supporting Obama) are old and tired. They’ve made their accomplishments, served the American people, and now they’ve decided to sit on the sidelines, rest on their laurels, and give interviews for the rest of their lives. As such their opinions are becoming increasingly irrelevant with age. Nader on the other hand still has fight in him. And as a result he remains more relevant than ever. Billy, good question. Please click on The Largest Minority and ask on Manila’s blog post, he may know. Is there a copy of what Ralph wrote to Howard? I voted for Cynthia McKinney.